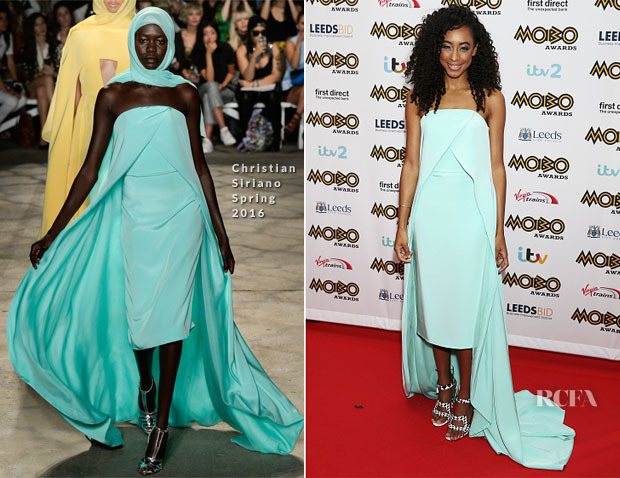 Corinne Bailey Rae attended the 2015 MOBO Awards held at the First Direct Arena on Wednesday (November 4) in Leeds, England. The singer wore an aqua Christian Siriano Spring 2016 statuesque column dress which becomes a striking head-turner with the addition of a flowing train. Factor in those chequered Sophia Webster sandals, and the head-turn becomes a double-take. While the look was probably designed for sunnier climes, I’m sure this managed to brighten up a cold wet night in Leeds. You can buy Corinne’s Sophia Webster Poppy checked Sandals from Net-A-Porter.com.